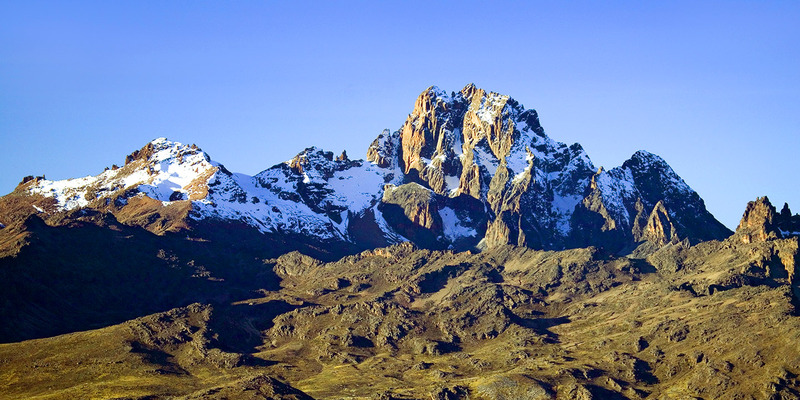 Mount Kenya National Park has Africa's second highest mountain at 5,199m high. It offers easy or challenging ascents with scenic beauty. According to Kikuyu folklore, it is the home of the Supreme Being: Ngai, a name also used by the Maasai and Kamba to describe God. In traditional prayers and sacrifices, Ngai is addressed by the Kikuyu as Mwene Nyaga: Possessor of Brightness. The name comes from Kere Nyaga the Kikuyu name for Mount Kenya, meaning Mountain of Brightness - Ngai's official home. Part of the mountain's fascination is the variation in flora and fauna as the altitude changes. The lower slopes are covered with dry upland forest, the true montane (mountain) forest begins at 2,000m is mainly cedar and podo. At 2,500m begins a dense belt of bamboo forest, which merges into the upper forest of smaller trees, interspersed with glades. In this area the trees are festooned with high altitude moss. These forest belts are host to many different animals and plants with at least 11 unique species. There are black and white colobus and sykes monkeys, bushbuck, buffalo, elephant and lower down olive baboon, waterbuck, black rhino, black fronted duikers, leopard, giant forest hog, genet cat, bush pig and hyena. More elusive is the bongo, a rare type of forest antelope. A number of other rare or endangered species can be found here: sunni buck, Mount Kenya mole shrew, skinks (lizard), and a variety of owls. Occasional sightings have been recorded of albino zebra. The high altitude heath at the top (3,000 - 3,500m) is generally open, dotted with shrubs: African sage, protea and helicrysum. The peak (above 3,500m) is moorland, with little game other than high altitude zebra and eland, common in the northern moorland. As Mount Kenya is a vital water catchments area for the Tana and northern Ewaso Ng’iro rivers, increasingly attention is being paid to the conservation of its natural forests trough different organizations. Mount Kenya National Park itself now has over 15,000 visitors a year who create their own environmental impact, so when visiting the park, please do bear this in mind and stick to the main trails.